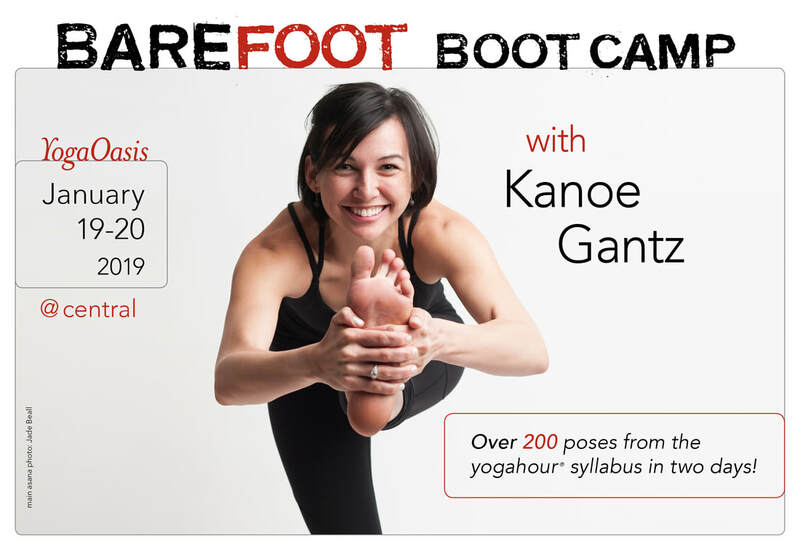 Join Kanoe Gantz for Over 200 poses from the Yogahour® Syllabus in two days. . .
Barefoot Boot Camp is a dharma difficult yet doable challenge: practice over 200 poses from the yogahour syllabus in two 3 hour sessions over two days. It’s asana without much academia. It offers education via experience. Arm balances only appear on Saturday. Backbends only appear on Sunday. All other poses appear both days. All levels welcome, although not recommended for students with injuries or major limitations. Kanoe Gantz E-RYT 200, RYT 500, YACEP, is grateful for the blessing of yoga in her life and is eager to share the practice with you. She appreciates the mind-body connection that is strengthened through practice and teaches yogahour to nurture that link in her students. Her classes will help you stretch, gain strength and make you sweat as you are encouraged with a smile.